Challenge No. 78 still needs some attention, but let's move on to No. 79. I don't know the answer to this one. My mother found this card today among her mother's papers. (Click the image to enlarge.) It bears the name, address and Social Security number of my great-grandfather, a Finnish immigrant. It measures 2½ inches by 3 inches, and is made of heavy cardboard. What was the purpose of this card? (sent off before I finished typing) Perhaps it's a union card. If the image on the left was clearer, it might be the logo. That's an interesting theory. He worked mostly in the woods, but may also have worked at local mills. I'm not sure, though, that those mills would have been unionized. I have one exactly like this, which belonged to my husbands grandfather (b. 1887 - died 1963). He was a telegrapher and later station agent for the RR. I do not know it's origin but don't think it was from a union. I note that the symbol on the left appears to be the Capitol and the circle on the right contains the statue of liberty. It is of very stiff cardboard and the lettering makes grooves in the cardboard. Could it have been issues by an insurance company? I'll be interested in the answer. You've described my card exactly. The card shows some natural wear, but it looks like the two symbols you describe have been deliberately scratched out. I've also noticed that the Social Security number is (apparently) incorrect. My great-grandfather's number ended in a 5, not an 8. 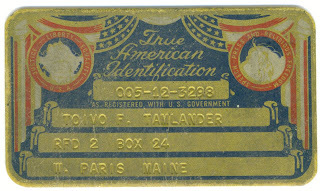 Given the location listed - this card would have been issued between about 1943 and 1948 when G.Z. retired and moved. He had to sign up for selective service in April 1942 (but his address then was not Winnemucca). I don't know when exactly GZ got his social security (actually Railroad Retirement Board) number. Could it have been issued by the government when he signed up? My mother theorized that this was an early Social Security card, but the cards haven't changed much since the 1930s. I'll theorize that these were private ID cards purchased for quick and permanent access to your own Social Security number. Finally, this link in the google newspaper archives turns up this 1938 newspaper ad [pdf] and this 1973 newspaper ad [pdf]. Looks to me like what you have here could simply be a privately purchased Social Security card showing your own name and Social Security number "as registered with U.S. government." Okay, Doogles, you've convinced me. He may not have had a driver's license, and this could have been his only ID—a little more durable than his "official" Social Security card. Perhaps he failed to write his SSN legibly on the order form and ended up with the wrong number on his card.